Louisville, KY - Maverick Tube Corporation, a large manufacturer of structural tube, mechanical tube, and conduit has installed a compact heavy-duty Braner/Loopco Single-Loop Turret Head™ Coil Slitting Line in its new Louisville, KY manufacturing facility. The new Slitting Line joins 60,000# x 72" x 1/2" and 90,000# x 84" x 5/8" Braner/Loopco Slitting Lines operating in Maverick Tube facilities. 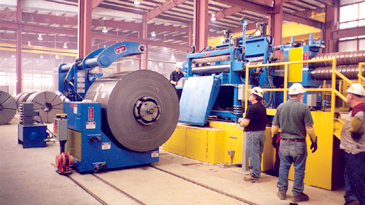 The new Slitting Line is capable of processing 60,000# x 60" wide hot rolled black, pickled, cold rolled, and galvanized carbon steel coils in gauges from .015" through 1/4" at line speeds to 1,000 FPM. The Slitting Line is equipped with Entry and Exit 4-Arms, Radio Controlled Entry and Exit Coil Cars, Crop Shears, a 2-head x 9" x 150 HP quick-change Turret Head™ Slitter, quick-change Tensioner, and a 250 HP x 2-ratio Recoiler. 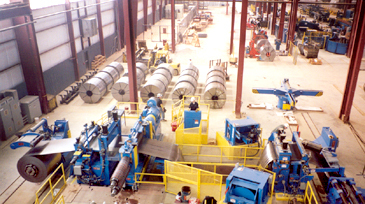 High-Production 60,000# x 60" x 1/4" Single-Loop Turret Head™ Slitting Line conserves floor space. * All line elements from end to end are within the operator's sight line, an important safety consideration. Hodgepodge cameras and TV monitors are unnecessary. The entire slitting line from end to end is within clear view of the operator, important for safety and operating efficiency. 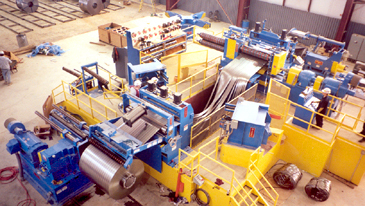 The compact Maverick Tube Slitting Line also employs contemporary "hi-pass line" equipment arrangement that positions the strip-processing equipment above the coil OD, which eliminates "reverse-bending" as the strip is threaded and processed. Hi-pass line benefits include fast coil threading, elimination of equipment-induced coil-breaks, elimination of strip surface scuffing from entry and exit rolls, generates straight sidewall slit coils, and outstanding productivity. Radio Controlled Coil Cars: The Coil Loading & Unloading Cars are operated via Braner/Loopco's new wireless radio controls instead of the common floor mounted or pendant controls. The wireless controls allow the operators freedom of movement and the ability to maintain a safe distance from the equipment and the coil. An additional benefit is the elimination of electrical pendant cable maintenance. "Wireless" controls are installed on both Entry & Exit Coil Cars. 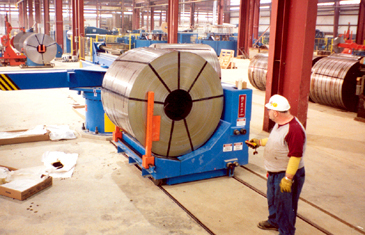 Freedom of movement allows operators to safely control Coil Cars from 10' away. Turret Head Slitter™: A 9" arbor x 150 HP 2-head quick-change Turret Head™ Slitter produces precise width tolerance slit strips with minimum burr throughout the entire range of gauges and mechanical properties. The Slitter arbors are supported in precision machine tool quality bearings installed into massive one-piece stress-relieved and 6-side precision ground solid steel housings that weigh nearly one-ton each. The rotatable Turret housing is supported on a 300,000# capacity anti-friction bearing, and the hydraulic cylinder positioned outboard arbor bearing housing is mounted on zero-maintenance anti-friction precision machine tool slides. Huge aluminum-bronze gibs capture the vertically adjustable upper arbor bearing boxes and provide "zero" axial arbor movement. Huge upper arbor bearing boxes are positioned by motorized anti-backlash screw jacks equipped with electronic encoder digital position readouts for fast and precise positioning.